"My quest is not yet over..."
Merjoram is a counterattacker that can land powerful blows like a brawler. 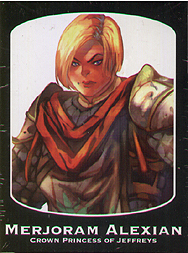 Her Tactics cards allow her to gain Power or Soak depending on the opponent's Power. Her cards have lots of Soak, Stun Guard, and movement, allowing her to close gaps between opponents and crush them no matter what attacks the opponent throws her way. This is an expansion for BattleCON and requires a core game box to play.